The Vasilyev siblings have established the first endowment for the UM Department of Nutrition and Hospitality Management. Pictured are (from left) Wendell Weakley, president of UM Foundation; Velmer Burton, dean of School of Applied Sciences; Kathy Knight, interim chair of nutrition and hospitality management; Bob Vasilyev; Rita Vasilyev; Scott Vasilyev and his wife, Candace; Renee Sholtis and her husband, Jonny; and Joey Vasilyev. UM photo by Kevin Bain. OXFORD, Miss. Like most parents, Bob and Rita Vasilyev are rarely surprised by the actions of their three adult children. So the Oxford couple was not stunned when the trio committed $130,000 to the University of Mississippi’s Department of Nutrition and Hospitality Management, establishing the department’s first endowment in their family’s name. Instead, Bob Vasilyev, president of Vasco Properties Inc., nodded in agreement as Scott Vasilyev (BSFCS ’01), their second-oldest, discussed why he supports academics at Ole Miss. Rita Vasilyev (BMEd ’71), co-publisher of the Oxford Eagle, smiled encouragingly when Renee Sholtis (BA ’97), her oldest and slightly shyer child, joined the conversation. And the couple shared a laugh when Joey Vasilyev (BSFCS ’03), the jokester of the family, discussed the beginnings of the family’s food service business. The Vasilyev siblings created the Vasilyev Family Scholarship Endowment with a $25,000 gift and an additional $5,000 to award the scholarship right away. The family also has committed to adding $10,000 $5,000 for the endowment and $5,000 for immediate awards every year for up to 10 years. The scholarship is intended for junior and senior nutrition and hospitality management majors, with preference given to students from Lafayette, Lowndes, Oktibbeha, Panola and Tate counties, where the family operates its six Taco Bell restaurants. Although the scholarship endowment is a first for the Department of Nutrition and Hospitality Management, the gift is not a first for the family. In fact, the Vasilyevs are widely respected for their philanthropic endeavors, including being lifelong supporters of Ole Miss athletics. Rita Vasilyev is the daughter of the late J.C. and Nina Goolsby, co-owners of The Oxford Eagle. Nina Goolsby was editor of the 6,000-circulation daily from 1961 to 2006. Joey Vasilyev, director of marketing for Vasco Properties Inc., credits the entire family for making them who they are today. From 1968 to 1972, Bob Vasilyev served in the U.S. Air Force. He later worked as assistant publisher at The Oxford Eagle for 15 years before leaving to found Vasco Properties in 1987. Scott Vasilyev and his wife, Candace, a UM pharmacy graduate (BSPh ’01, PharmD ’03), live in Oxford with their children, Vivian and Alexander. The Vasilyev brothers said they opted to establish an endowment for hospitality management because the field is one of the nation’s fastest growing as well as one of the fastest growing academic programs at Ole Miss, with more than 400 students pursing degrees. “Hospitality management is a consumer-driven field, and Ole Miss has a great group of dedicated, student-oriented faculty preparing students to become professionals in this exciting field,” Scott Vasilyev said. Sholtis, an English and journalism graduate, wholly supports her brothers’ decision to establish the endowment. Sholtis lives in Fairhope, Ala., with her husband, Jonny, a UM law school graduate (JD ’97), and their two children, Sophie and Oliver. Gifts like these allow the department to continue providing outstanding opportunities for students, said Kathy Knight, interim chair of nutrition and hospitality management. For the two proud parents, the newly established endowment is a legacy that can live on for many years into the future. “It’s a way to always tie me to my university and my hometown, and that’s worth it for me,” Rita Vasilyev said. 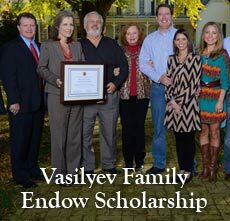 Individuals and organizations interested in contributing to the Vasilyev Endowment can send checks to the University of Mississippi Foundation, P.O. Box 249, University, Miss. 38677 with the endowment noted in the memo line. Gifts also can be made by contacting Gloria Kellum, development consultant to the School of Applied Sciences, at 662-915-1081 or gkellum@olemiss.edu, or by visiting http://www.umfoundation.com/makeagift.